Kaci is still trying to get us a ride to Alaska. The good news is that we’ve moved into 63rd place because David Sawatsky and Newton Marshall dropped out. We’re still in. This gives me time to post and also to run for Pope. Say What??? Yes, I’m running for Pope over at Mollie’s. I’ll let you know when the vote is so we can stuff the ballot box. You can read about my qualifications here at Mollie’s blog. The racing thing isn’t going as well as I thought and I need the job. You have to get used to Mollie’s SE English accent but she’s a hoot. It’s gonna be close because one of the other 2 candidates is Mollie’s sibling, Alfie the cat. I hope that Alfie doesn’t get to count the votes. I will vote for you – I want a black female popie. Can I have an audience then? …. in Avignon? Oh, no. Not Avignon. The job prohibits me from going there. How about Lourdes? Only if you can get out of the house with the Zamboni around. Oh my word! My two funniest dog blogger comedians (I self proclaim) in conversation, this is just to good. 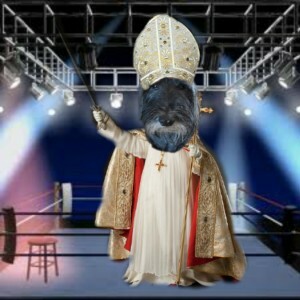 And Kyla you would make a excellent pope! Alfie must want it also-missing dinner? That’s dedication. Kyla I think the Scotty conclave of cardinals is voting for you. Even though you are moving up you still have to pass a finish line. Is passing the finish line in the rules? I’ll have to check on that. I just checked it out. You don’t have to cross the finish line if you didn’t cross the start line. geez louise ~ you know louise Kyla ~ Another race for the middle! You gots my vote! I just can’t vote 4 a cat (or squirrel). There’s no candidate that’s a squirrel. The worst thing someone could do would be to write-in a squirrel. Kyla for Poop! Uh…Pope. You got my vote baby. I knew you were in my corner! Hey…I’ll even kiss your ring. And drive you around in the Poop Mobile, uh, Popetress Mobile. And I’ll be really careful. Sort of. We’ll have fun, though, tooling around in the Poop Mobile. That’s it, we must change your moniker when you win. Kyla the Wonder One. Anyway, as we were trying to say, we couldn’t possibly have a C-A-T telling us what to do – that is so not naturally correct. So, Kyla that job is yours, so say the Sparhawk Boys. I don’t plan on telling you what to do very much. You’re doing fine “as is”. Shhhhhhh, don’t tell the others but I’ll send a treat your way! When do we vote, we got like all the neighborhood doggies to give us their proxy, so we have about 65 votes to cast! Good job. Now that you can drive, you’re reaching more voters. Thanks. The vote is sometime next week, it’s up to Mollie. The other two candidates must present their cases first. Gee, I dunno. Mollie makes the rules (probably as she goes along). We definitely need a scottie! I’m running against two felines. Vote for a kitteh???? Are you nuts?! Never. You fursure gots my vote Kyla! See you at the starting line-I think we just got a ride. I need to sow my wild oats in the race before I assume Papal duties. Come North to Alaska-we’re allowed 16 dogs. The only candidate as far as I am concerned! Thanks. Floyd may get a vote also. Running for pope on Mollies?! Only you lot could cook up such an amazingly crazy and hilarious scheme while whee were away! Well, Mollie wanted to give it to Alfie by default. Nope, I wanted in. Another cat did also. Mollie cooked it up and she’s in charge. I’m rooting for you Kyla! Thanks. We need a lift. Oh rats. I’m black, though.